Enhancing the patient experience, ROCKFON® Medical stone wool ceiling panels are easy to clean and disinfect, while meeting health care facilities’ attractive design goals, sustainability objectives and stringent performance requirements. ROCKFON stone wool ceiling products are made from basalt rock, which naturally provides acoustic performance up to 0.90 Noise Reduction Coefficients (NRC), fire protection with UL/ULC certification for Flame Spread and Smoke Development, and dimensional stability at up to 100 percent relative humidity. Stone wool has no nutritional value and therefore it provides no sustenance to harmful microorganisms. 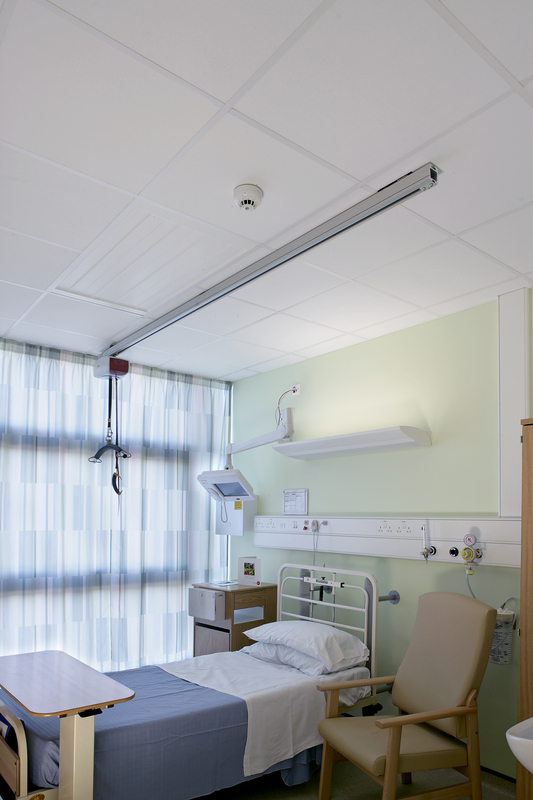 All ROCKFON Medical ceiling panels also are Methicillin Resistant Staphylococcus Aureus (MRSA) resistant. For areas with essential hygiene and cleaning requirements, such as corridors, administration, waiting areas and nursing offices, ROCKFON Medical Standard is classified to Bacteriological Class B5 and B10. It has a low particle emission resulting in Clean Room Classification ISO Class 5. As hygiene and disinfection requirements increase – for instance in emergency rooms, delivery rooms, small surgery, radiology, laboratories and patient rooms – ROCKFON suggests Medical Plus (Bacteriological Class B1) for these applications. It has a low particle emission resulting in Clean Room Classification ISO Class 4. ROCKFON Medical Air (Bacteriological Class B1 and B5) has an airtight backing membrane and sealed edges suitable for high-risk areas, such as operating rooms, recovery rooms and intensive care, where air pressure is controlled to prevent the spread of infections. It has a low particle emission resulting in Clean Room Classification ISO Class 3. 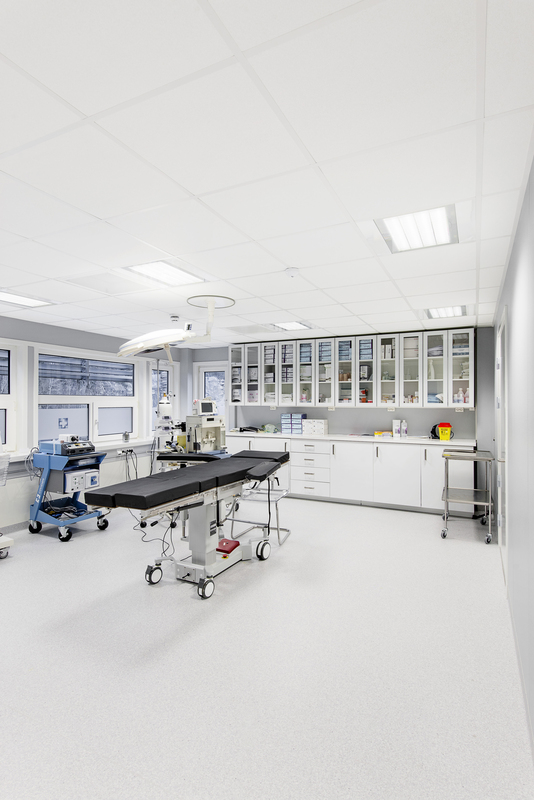 All ROCKFON Medical ceiling panels are available in 2-by-2 foot or 2-by-4 foot modular sizes with a square lay-in edge. ROCKFON Medical Standard and ROCKFON Medical Plus panels also offer a tegular edge, plus ROCKFON Medical Plus panels may be specified with a concealed X edge. Featuring a smooth white surface, ROCKFON Medical ceiling panels contribute to health care facilities’ sustainability by reflecting 83-86 percent of available light. Enhancing energy efficiency, the better distribution of light helps lower the lighting load and reduce cooling costs. Further contributing to environmental goals, ROCKFON Medical stone wool ceiling products contain up to 42 percent recycled material and have earned UL® Environment’s GREENGUARD Gold Certification for low-emitting products. ROCKFON stone wool ceiling products supplied in North America are supported with a 30-year warranty. ROCKFON’s extensive portfolio ranges from suspended and concealed ceilings to clouds and baffles. The new ROCKFON Medical Product Range brochure can be downloaded from www.rockfon.com. Choose the Tools & Documentation section, select “Rockfon Group” and click “Brochures” for a downloadable copy (PDF) of this brochure, as well as ROCKFON’s new catalog, case studies, technical articles and more.